Person B: You are saying we should live as slaves then. Person C: Or inactive life, I think they do not believe in free will. 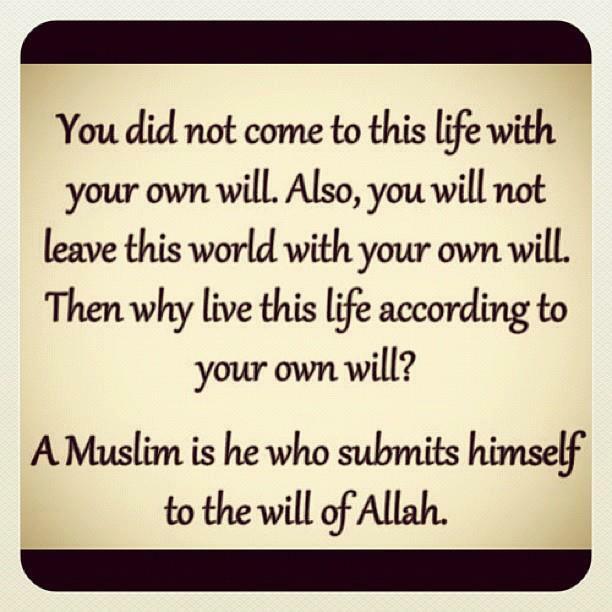 Person A: We got to submit to the will of Allah. If he created us, if he sustained us, he is the best person to let us know the purpose of our life. Person A: And well, in Islam purpose of life is to worship Allah. Worship may make confusion as people consider prayer as the only worship. In Islam, smiling to a brother is a form of worship, that’s what Allah expect from us. Worship him via all the actions, whether it is at office, whether it be at home, whether it be conversing to people. Person B: Creating something for his own purpose and use, doesn’t it look like a human quality or is it that the Almighty is selfish. Person A: Brother, we need to live according to his terms. 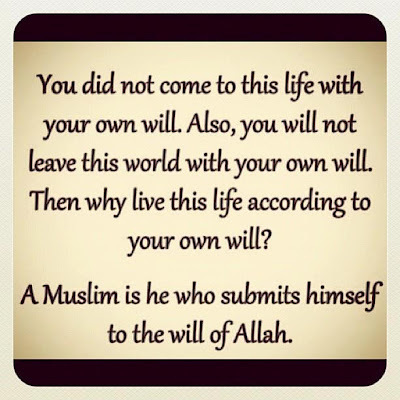 If you read the quote correctly, it says ‘A Muslim is he who submits himself to Allah’; the word “Muslim” means a person who submits to will of Allah. Person B: That’s how we make robots too. Person A: Verily, in the creation of the heaven and the earth, and in the alternation of night and day, there are indeed signs for men of understanding. Person A: That’s a good comparison. Brother, if you really want to know it, please go thru Quran, because Islam is the matter of faith and science. Person B: Faith I will agree but Science, it’s only simple logic and can be put to anything present on this planet, any books, any novels, there will be science in every word, it depends on how one want to interpret it. Person B: Believe it or not, many years from now communism will fall into this trap of religion and a god will be created for it. Person A: In Islam worshipping Allah is like living in full freedom, it’s like that we are secured from all harmful things and evil deeds. Islam is a religion of freedom for those who understand it very clearly and in simple manner. Person B: I guess I don’t understand it then. For me freedom is something more than what you said, it’s living my life the way I want it. Person A: You think you are free when you wish or think by yourself, but you are not. Forget Islam and rules of Allah, you obey man made rules such as court rules, traffic rules, company rules, school rules. Many of the man made rules are faulty even then what is stopping you to understand and accept the rules of almighty Allah. That is complete submission to him without any partners. Person B: I don’t want to obey or follow any human rules, but people are forcing it on me. My whole life I will try to get freedom from all this, in that course how can I put another burden on my shoulders. Person A: Brother, think about it. You cannot deny the fact that you are here, living in this earth for a purpose. Person B: The only truth about all that’s living is death. Whatever we do and however we do it, it will happen to all that’s living and no one can stop it. So enjoy the life, that is all I can say because it’s a onetime opportunity, leave everything aside and live it, not for me not for anyone else but for you. This is a very vast & controversial subject,it is difficult say all in a comment. True but it is interesting though. As indu said above a topic that is huge. Faith and religion is a matter of choice. How one worships God is also a matter of choice! controversy starts from the basics...its sad how religion creates the greatest!